As part of our commitment to continuous process and quality improvement, Tempco recently added an Amada EMK M2 Series turret press to our lineup of metal stamping and fabrication equipment. This state-of-the-art Amada system offers the highest real-world hit rates and ram positioning accuracy of any turret press on the market, and can process 10’ x 5’ metal sheets without repositioning. What does that mean for you? More precise parts and greater manufacturing efficiency to get your project done better, faster. Our Amada turret press provides numerous benefits that help us create your metal stampings and fabricated parts with better quality and accuracy. Precision ram motion control—including separate controls for speed, stroke length, hover height, and hold time—reduces tooling wear and punching noise. This benefits both our customers (more parts with fewer tooling changes for faster service) and our production team (quieter is always better!). The EMK M2 is capable of producing complex parts with exceptional accuracy. 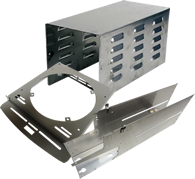 It can create louvers, cutouts, tapped holes, and other special features to give you complete-to-print parts that match your exact specifications. To give our Amada turret press even greater efficiency, we have also installed an automated material tower. With a fully-automated material feed, the turret press can run lights-out for 24/7 production. It’s another win-win for our customers and our staff: our customers get even faster turnaround times on their metal stamping and fabrication projects, and our team can get work done while they sleep! To put our turret press and other high precision manufacturing capabilities to work for you, request a quote on the metal parts you need or contact Tempco to discuss your project.